Students in the course Christian Ethics 223, “Queering Ethics,” taught by Prof. Sarah Azaransky at Union Theological Seminary, visited the Burke Library on Wednesday, March 6th, to discuss queer frameworks of power, authority, and queer subjecthood in relation to archives. The class and I delved into hands-on archival inquiry with the papers of emilie m. townes, a former professor at Union and currently the Dean of Vanderbilt Divinity School, a self-identified lesbian and a leading figure in womanist thought. We framed our activity with discussions of archival theory, with readings from Derrida and Foucault among others. The students debated the ethics of archival acquisition processes and research — especially as it affects the history and lives of lesbian, gay, bisexual, transgender and queer (LGBTQ) persons today. For several of the students, this encounter at the Burke Library was their first time handling archival documents. In preparation, the eighteen masters-level students in the class read a literature review of theoretical views of the archive by Marlene Manoff titled “Theories of the Archive from Across the Disciplines” (Libraries and the Academy, 2004, 4:1). We framed our discussion around ethical issues at play in critical archive studies when it comes to the custodianship of both literal archives as well as the proverbial collective archives of social memory. If, as Derrida says, “There is no political power without control of the archive,” who decides what is kept in the archive, and how is their political power sustained? When it comes to topics in LGBTQ studies, especially in art, literature, and political movements, key figures often defy typical organizational frameworks, and resist categorization. How do researchers identify a gay or transgender writer, for example, who spent their early life in the closet, and was not labeled as such or recognized for their work (or their identity) until later in time? What are the power dynamics at play for archivists, in curating and making primary-source materials of these figures available and searchable for scholars? How do researchers with questions pose their inquiries without being imposing on, or intrusive to, queer subjects? Hefty questions indeed. After a break, we shifted gears from discussing archival processing to handling materials from the emilie townes papers first hand. The students worked in pairs to examine the contents of one document folder each from the emilie townes papers, including some manuscript writings from early in her PhD program. 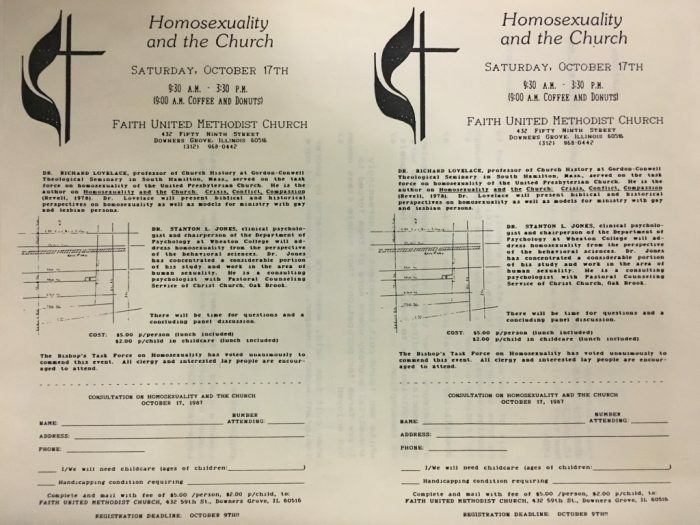 One group found that some of Dr. townes’s personal research notes had been typewritten on the back of what appeared to be event flyers or inserts for church program booklets. The students speculated it may have been to save paper, but the reason was not readily apparent; we were unable to tell from the Finding Aid whether the existence of these flyers had been previously documented at all. One of the event flyers (pictured below) advertised a 1987 event called “Homosexuality and the Church” at Faith United Methodist Church, in Downers Grove, Illinois — a particularly eye-catching object, given the present ongoing debates concerning homosexuality in the UMC denomination. (Leaders at the recent UMC General Conference in St. Louis, MO, debated and voted to reaffirm the current stance of the denomination, that “the practice of homosexuality is incompatible with Christian teaching.” But the debate continues, as numerous LGBTQ-affirming UMC churches around the world maintain the contrary stance, in welcoming solidarity with their LGBTQ communities.) It is truly a pressing issue, one that is deeply personal to me and to many students at Union. Yet, from a cursory look, without apparent information about this document, we cannot know how it came to be among her papers, nor what role this event played in Dr. townes’s life and education. A key takeaway from this exercise, predictably, was that archival documents often raise more questions than answers. “Homosexuality and the Church” event description page, on the verso of a typewritten document of research notes, from the emilie m. townes papers, series 2, box 2, folder 3, Archives of Women in Theological Scholarship, the Burke Library at Union Theological Seminary, Columbia University in the City of New York. Some of these masters-level students are beginning to consider the possibilities for continued graduate study, and possible projects for future archival inquiry. 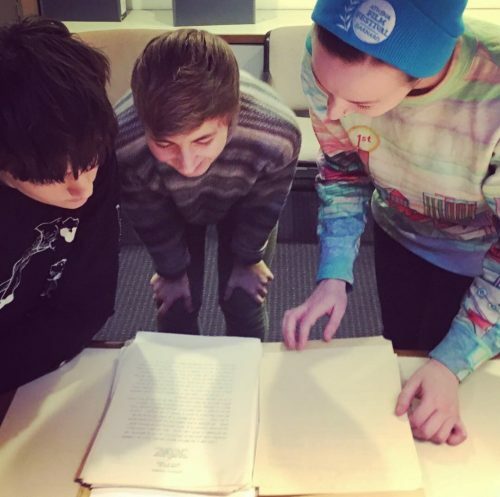 Some students are even considering collaborating on a potential project on the LGBTQ history of Union Theological Seminary together, requiring extensive time in the UTS records held at the Burke archives. Such a project would be a hefty undertaking, but one of great value to the community here, I have no doubt. In the end, the session received a greatly positive response, and it seems these intrepid students thoroughly enjoyed their close encounter with the archives. This entry was posted in Archives, Collections, History, Manuscripts, Union Theological Seminary History and tagged Archives, History, LGBTQ, queer, Union Theological Seminary on March 8, 2019 by Carolyn Bratnober. Foreign missions. It's a pretty unpopular concept these days. Missionaries are associated with all the damage wrought by the project of subjugation, exploitation, displacement, and genocide of native peoples and cultures across the world. The criticisms are well-founded. Retrospect is a tricky thing though. History is often tainted by a touch of arrogance and a total lack of appreciation for how complex, messy, and nuanced real people and situations actually are. We have a tendency to think that people were ignorant "back then." We "know better now." This is an idea that we like because it feeds our whole complex about "progress"… it makes us feel like we are better and smarter than those naïve people who preceded us (but wait, that’s an idea of Western imperialism…woops!). One of the best cures for the claims of revisionist history is a consultation with the archives. 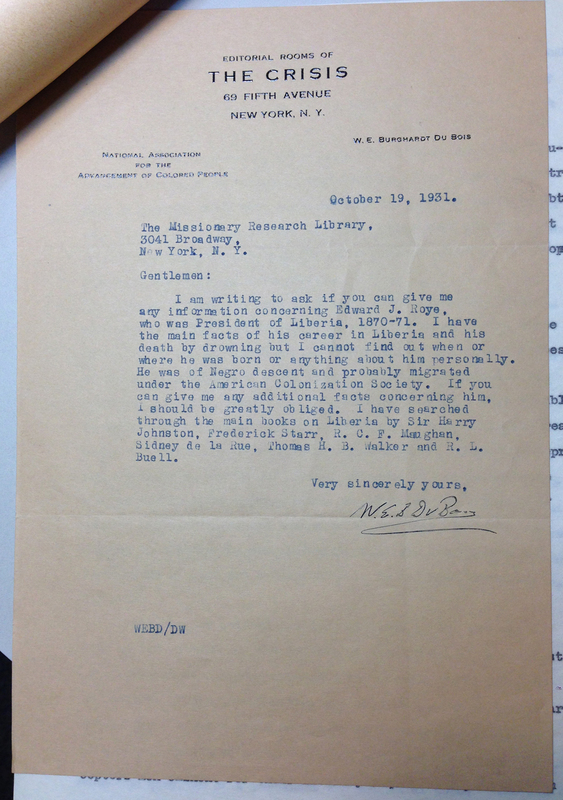 While working with the Missionary Research Library Archives at Burke Library I processed MRL12: Personnel Policies of Foreign Mission Boards Records, a collection of 500 completed questionnaires that had been distributed in 1950 to former missionaries. Missionaries of the 19th and 20th centuries: Who were they? So who were the foreign missionaries from the 19th and 20th century, and how did they understand the work they were doing? Were they really the offensively ignorant, racist, arrogant, and condescending bunch that we often imagine them to be? Or were they actually in many cases humble, compassionate, self-aware, and even critical of foreign missions boards and those in power? The answer is, of course, both. I certainly came across some questionnaires that included absurdly myopic statements about "heathens." Some of them actually made me cringe. But most of the missionaries sounded basically the same as people today: conflicted, confused, frustrated with the shortcomings of their relationships and the limitations of the situations they found themselves in, but still hopeful, generally well-intentioned, and striving in the best way they knew how to achieve positive outcomes. Shocking, I know. Looking through these survey questionnaires, I was really interested to discover that the most common concerns expressed by missionaries were imperialism, top-down policies, outmoded paradigms, bigotry, and paternalism. While these concerns obviously serve as evidence to substantiate the criticisms of foreign missions, they also reveal how many individuals were fully aware of, and attempting to work around, the problems posed by imperialism. The voices of these missionaries serve as some of the most arresting indictments of missionary work. Ironically, it seems that the original postcolonial critics were colonizers themselves. Foreign Missionary Record #1600. Credit to MRL12: Personnel Policies of Foreign Mission Boards Records, box 5, folder 6, The Burke Library Archives (Columbia University Libraries) at Union Theological Seminary, New York. This entry was posted in Student Entry and tagged Archives, History, Imperialism, Missionaries, Missions, MRL12, students on August 30, 2012 by Kristen Leigh Southworth. I’ll admit that prior to getting my job in archives at the Burke Library, the extent of my familiarity with archives was based on some combination of the following: Obi Wan Kenobi’s search for the mysterious planet Kamino in the Jedi Archives in Star Wars Episode II, Tom Hank’s struggle to get into the Vatican Archives in Angels and Demons, and my brother’s strange obsession with using archival materials to dig up our family genealogy records. Yet despite my overall ignorance, somehow nothing in the world sounded more exciting than spending hours at a time holed up in a dusty library tower, sifting through boxes of materials that time (almost) forgot. I’ve also always secretly wanted to be a librarian. What can I say? I’m book-ish. I’m also admittedly a vintage kind of girl; I like reclaiming the old for the new. On top of that one of the major things that attracted me to coming to Union Theological Seminary for my master’s degree was that it boasted of having the “largest theological library in the Western hemisphere,” with holdings of over 700,000 items, including extensive collections of rare archives and special materials. I wasn’t exactly sure what that meant. But it sure sounded cool. On my first day at work I was shown to my desk, introduced to the others in the tower, and given a tour of the archive storage facilities. All of that was pretty much what I expected. But then I was handed several academic articles on archival theory and told to spend the next couple of days reading and familiarizing myself with the material. A crash course in library and information sciences: not what I was expecting. I had always wondered what a degree in library studies could possibly entail. Having always been a pretty organized person, all my life it had seemed to me that the proper place for anything was basically self-evident. But of course, real truth is always a moving target, and what is self-evident to me at one moment may be in no way evident to someone else in some other moment. “Facts” are never as secure as we want them to be. Information is always being framed and re-framed by the motivations and assumptions that give it context, and context is made up of a thousand silent and invisible factors that create the paradigms that give facts meaning and make information matter. During that same semester I was also taking a class that covered roughly a thousand years of church history. Union’s world-renowned history department prides itself on teaching seminarians to read history not as students but as scholars, meaning that we are never given a history textbook to tell us “what happened.” Instead, we kept reading from, and hearing about the importance of, primary documents and sources. Primary documents are original historical documents, and they are incredibly empowering. By consulting primary documents you are consulting history itself on your own terms and with your own questions. You don’t have to settle for some other scholar’s version of the story (and for women, you don’t have to settle for what is so often his-story). You can draw your own conclusions, make your own connections and interpretations, solve your own mysteries, draw up your own report. This is what makes the Burke Library at Union Theological Seminary so important. This is why people travel from all over the world every day to come here and look through our records, to lay their eyes on those primary sources and sleuth out their own facts, asking their own questions, writing their own stories. Through this work, I have had the opportunity to collect my own information and begin writing my own stories about a variety of subjects, most of which are vital to the writing and the work that I hope to do as an ecumenical Christian. Maybe it is just the artist in me that possesses such a deep appreciation for tactility, but being able to see and handle primary documents for myself has led to some truly profound insights. It is one thing to read a .pdf article or a published book containing transcriptions of text that someone wrote 200 years ago; it is quite another thing to hold in your own hands the fragile, slightly crumbling sheets of paper that the 200-year-old author actually scrawled his or her ink upon. One major shift in my perspective happened early on while working on my second collection. I found two letters from 1901 written by Badi’u’llah and Muhammed Ali to the newly-established Baha’i faith communities in the United States. The language and style was so reminiscent of the letters that Paul wrote to the Christian churches of the first century. This somehow gave clarity, potency, and incarnate form to the way I thought about those ancient texts. The words are now translated into hundreds of languages, printed and bound in hundreds of editions of what we’ve now come to call the sacred “New Testament,” the Word of God. But at one point, they were just letters. Real letters. Could it be possible that such a worthy fate would befall any of these documents I am currently now holding in my hands? It was then that the somewhat obscure, behind-the-scenes work of library archivists throughout time began to take on huge significance for me. I realized that this is not just a quirky part-time work-study job of organizing boxes, books, and folders. This job is about shaping history. It is about empowering the people of the present and the future to write their own stories about what they believe happened in history, and why. And as it turns out, nothing in the world is more exciting after all. This entry was posted in Student Entry and tagged Archives, Burke Library, History, library science, students, work-study on August 23, 2012 by Kristen Leigh Southworth. What is MRL and WAB? You may be asking yourself, why should I care about the Missionary Research Library and the William Adams Brown Ecumenical Library? The Missionary Research Library (MRL) was created by John R. Mott in 1914 after the Edinburgh World Missionary Conference of 1910. It was created in response to the need for a central resource to provide information for the development and preparation of missionaries, as well as a documentary source for the history of mission work. 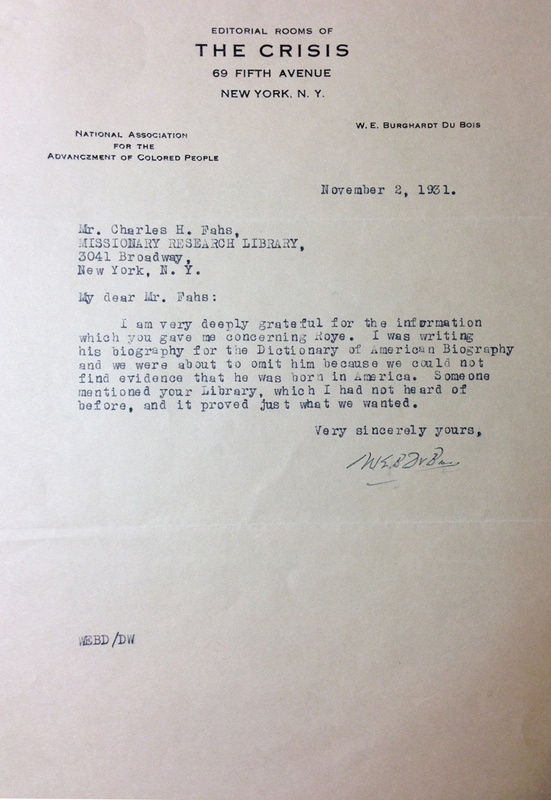 Mott stated that his intention was to create “the most complete and serviceable missionary library and archives in the world,” one that would be interdenominational, ecumenical, international, and rich in source material. He was the chairman of the Library Committee of the Foreign Missions Conference of North America, which sponsored the project, and he secured the financial support of J. D. Rockefeller, Jr. Two administrators were chosen to develop the library. Charles H. Fahs became curator and Miss Hollis W. Hering became librarian. Active missionaries consulted the library’s materials while on furlough and missionary boards, organizations, and individuals regularly donated materials. By 1929, the library contained more than 70,000 books and pamphlets, including many scarce materials. Originally located at the Madison Avenue headquarters of the Foreign Missionary Conference of North America, MRL moved to Union Theological Seminary’s Brown Tower in 1929. Financial difficulties, which plagued MRL for years, continued until 1967 when it was fully integrated with the Burke Library at Union Theological Seminary. The Burke Library became part of the Columbia University Library System in 2004. The William Adams Brown Ecumenical Library was established in 1944 by vote of the directors of Union Theological Seminary as a memorial to Dr. Brown, who had been Roosevelt Professor of Systematic Theology at UTS. The ecumenical movement was a new interest in his later years, and the nucleus of the memorial collection came from Brown's working office library. The Ecumenical Library officially opened on March 13, 1945. As it did then, WAB serves as a source for the documentation and study of modern ecumenism. MRL contains over 160 unique collections from missionaries and missionary organizations from six continents in the late 19th and early 20th centuries, with special strength in early 20th century China, Japan, and Korea. This collection contains a broad range of field reports, demographic surveys, and other analytical data. As a result, the MRL Archives document the cultural and social realities of indigenous populations in substantive detail, and will amply serve scholars of religion, historians, anthropologists, economists, and medical researchers, among others. WAB contains over 30 collections, including records of local (NYC), national, and international ecumenical organizations and communities, as well as records from ecumenical conferences (Protestant and Catholic dialogue) that have shaped global Christianity. This entry was posted in History and tagged Archives, History, MRL, WAB on August 22, 2012 by Brigette C. Kamsler.